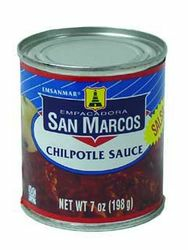 San Marcos Hot and spicy, chipotle hot sauce from smoked red jalapenos, onion, tomato and spices. (pronounced "chee-POHT-lay"). Chiles chipotles San Marcos preparados con jalapeños ahumados, salsa de tomate con especias, vinagre y chile ancho. This is simply the most delicious and authentic Mexican sauce I have ever found. I will only shop at stores that have this product regularly on their shelves, otherwise I go somewhere else! This is the perfect blend of Tomato sauce and Chipotle in Adobo sauce... I love the smokey, sweet spicy blend. One of the things i love to do is to mix equal parts of this salsa and Ketchup and use on my steak or as a dip for Tortilla Chips! I'm so glad i found this Salsa!!!! ProsThe ease in mixing it into other sauces or soups/stews. I love the smokey, spicy, sweet flavor it imparts.